This Moon Phase Science Pack is perfect for teaching the NGSS concept of patterns and cycles! 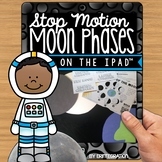 Not only does it have hands on games, activities, and STEM connections, but this pack gives you 10 activities that will help your learners get the tips and tricks they need to retain the phases of the moon! Turn oreo cookies into the MOON PHASES with your class! Students love this and they get a snack once they are finished. WIN WIN! Hands on activity to review the phases of the moon using oreo cookies. Activity includes a printable vocabulary review. Also included is a printable student sheet to be used to draw and label the phases of the moon as they create them on the oreo cookies. Use Oreo Cookies to model the phases of the moon! 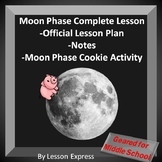 This worksheet has complete instructions as well as an area for students to illustrate their models and answer questions realted to their models and the phases of the moon. This lab is designed to help students learn the 8 phases of the moon. 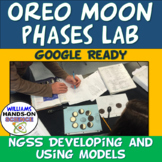 By using Oreos as models, students create the phases on each cookie, put them in order oh paper plates, and label each phase. It shows students the sequential order of the phases and serves as a great visual model! This product shows two different projects for showing moon phases. The powerpoint demonstrates moon phases in the form of paper plates. It also shows moon phases created with Oreo cookies. This activity page provides a fun way to reinforce four of the moon phases. Also included, are reading comprehension response questions that go along with the activity. What a great way to integrate Reading and Science!! !